If your poodle mix has a typical poodle coat, you will need to groom it weekly and clip it every 6 to 8 weeks to keep it trim. An overall clipping will give your dog the "lamb look" that most pet poodles and mixes sport. The dog's coat is curly and fuzzy over the entire body, with a more defined trim on the tail and a closer trim on the paws. 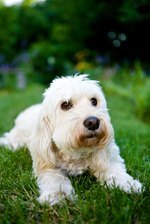 Gradually teach your poodle mix to be groomed as a puppy, so it will be comfortable standing for brushing and clipping as a grown dog. Brush your poodle mix with a slicker brush prior to bathing to remove any loose coat and find any mats or knots in the fur. A poodle does not shed, so if your dog has a poodle coat, you will need to brush regularly to remove the dead hair and allow for air near the skin and new hair growth. Bathe your poodle mix before trimming or clipping so the hair is fluffy. Use a dog shampoo designed for your dog's coat type or color. Use a tearless shampoo for the face and outside of the ears. 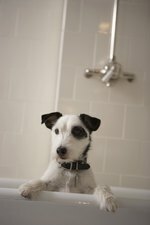 Dab a bit on a washcloth and clean the dog's face, and rinse with clean water on the cloth. Avoid getting water in your dog's ears. Towel dry, then blow dry your dog with a hairdryer on a low setting. Leave the dog a bit damp and let it finish air drying to avoid drying the skin. Put your poodle mix on a grooming table or on an even, flat surface covered with a towel. Begin clipping at the back of the neck and work down the dog's back to the middle of the legs and the dog's stomach. A No. 5 blade is good for most poodle coats. Comb through the hair on the legs with a greyhound comb. Carefully scissor the hair from the knee down so it is even with the hair on the top of the legs. Trim the paws closer. Pick up the paws or lay the dog down and trim the hair on the bottom of the paws between the pads. Trim the tail with scissors, removing any long hairs. If the dog has a poodle tail, trim the base with the clippers and leave a pom-pom at the end. Trim the head with scissors, leaving as much hair as you like on the dog's face. Trim carefully around the ears, and remove any long, straggly hairs inside the ears. Trim the nails with a nail clipper or a grinding tool. Avoid cutting too close to the quick or the nail will bleed. Keep some styptic handy for this.